A Friday poll showed that majority of Poles oppose a U.S. missile defense base. The survey, by the publicly funded CBOS institute in Warsaw, said that 56 percent of those questioned oppose putting the base on Polish territory - a level of resistance that has remained fairly steady over the past months. The poll said that 28 percent favor the plan. A similar poll in July put opposition at 55 percent and support at 28 percent. The U.S. wants to place 10 interceptor missiles in Poland and a radar base in the Czech Republic, contending the system will protect most of Europe from long-range missile strikes from Iran. Russia, however, has expressed outrage at the idea of U.S. military installations so close to its borders, and threatened the shield could lead to a new arms race. 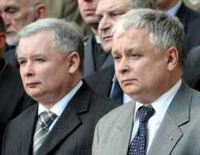 Poland's nationalist and conservative leaders, Prime Minister Jaroslaw Kaczynski and his twin brother, President Lech Kaczynski, have voiced strong support for hosting the system. However, Warsaw and Washington are still negotiating specifics and a final agreement is not expected until later this year. The CBOS poll questioned 859 people Aug. 3-6 and gave a margin of error of plus or minus 3 percentage points.